This has been my dream from couple of years now and it happened finally! 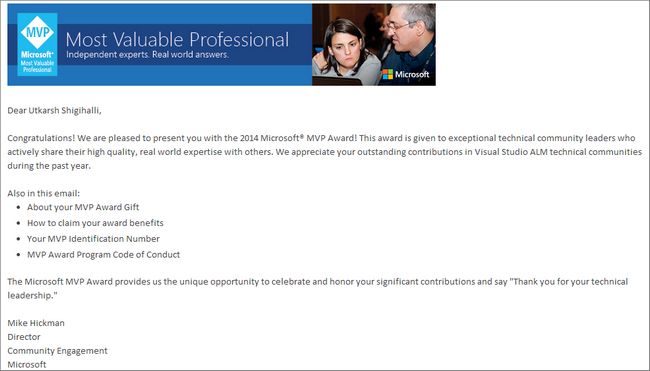 I received a mail 2 days back from Microsoft announcing I have been awarded as MVP for my contributions to ALM. Below is the mail extract I received. I feel very happy that Microsoft finally recognized my effort. Needless to say this award has re-energized me and has motivated me immensely to do more. My special thanks to Tarun for supporting and acknowledging my efforts beginning of the year 2013, which I think is the main reason I was able to do what I did. Thanks Tarun. So... how did it feel recording training for Microsoft?